LANSING — While Lake Michigan protectors are fighting a threatened carp invasion, managers in Israel are dumping them into the Sea of Galilee. That’s just one of the differences in managing two of the world’s largest lakes that emerged during a recent conference between lake managers from Israel and the Great Lakes region. 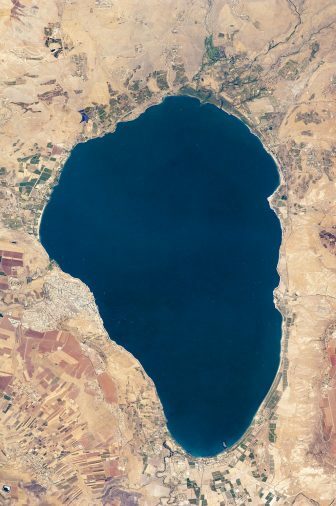 Lake Kinneret, in northeast Israel, is only about 13 miles long by 8 miles wide but is the largest freshwater lake in Israel.That’s much smaller than Lake Michigan, which is 307 miles long by 118 miles wide, but the researchers said the two bodies of water share similar challenges. And the differences are also a learning opportunity for both groups, they said. Where management of the two lakes differs greatly involves silver carp. Scientists and policymakers are fighting to keep such a harmful invasive species out of the Great Lakes. But in Israel, silver carp are deliberately added to Lake Kinneret. Silver carp aren’t a danger to the lake because they can’t reproduce, said Tamar Zohary a researcher with the Kinneret Limnology Laboratory in Israel. The lake has no fast flowing streams that allow carp to spawn, thus their numbers are kept under control. And the carp are beneficial to Lake Kinneret because they eat phytoplankton and have commercial value, she said. “It is an asset to fisherman and the economy of the region,” she said. Another difference is the focus on eradication versus prevention of invasive species. While eradication is important for Lake Michigan, its scientists put a large emphasis on prevention. Education and outreach are essential for raising public awareness, said Brian Ross, a fish ecologist with the Department of Fisheries and Wildlife at Michigan State University. A second ongoing discussion focuses on ballast water treatment and how to prevent transferring invasive species by boat. Prevention is harder at Lake Kinneret because it “takes some vision, some experience, some knowledgeable scientists and some money,” Zohary said. They aren’t there yet. Both Lake Kinneret and Lake Michigan are big tourist destinations. But while Lake Michigan has the help of private investment, it’s a different story in Israel. Lake Kinneret attracts about 4 million people each year, said Orit Skutelsky, the director of resource initiatives with The Society for the Protection of Nature in Israel. “National resources are developed for the people,” he said, not for companies. A public campaign has started to add a hiking trail along the shore of the lake to make it even more accessible to people, Skutelsky said. The trail would bring awareness about water levels, which need to be stable before tourism can increase. Tourism is also important for protecting Lake Michigan, but managers do turn to private investment. “It is common in Michigan to look toward private companies to help pay for things,” said David Lorenz, vice president of Travel Michigan. American companies, such as the Eastman Kodak Co., are big funders of national parks in the Great Lakes region. Promoting the lake as a travel destination raises awareness about the importance of water, Lorenz said. “We don’t promote it, we can’t protect it,” he said. Tourism helps pay for resource management. Both groups said fish are important to both lakes but for different reasons. Lake Michigan is part of a fishery worth around $7 billion, said John Dettmers, the director of fisheries management with the Great Lakes Fisheries Commission. Managers recognize the important economic and societal values of the fishing industry. The managers of Lake Kinneret said they are focused more on the societal value of the fishery than on the economic value. of view,” said Doron Markel, a researcher with the Israel Water Authority. It is most important socially because the lake supports at least 200 fishermen. This doesn’t contribute much to the national economy, but it is important locally. Both lakes suffer from overfishing. Lake Kinneret had a fishery crisis in 2008 due to overfishing, Markel said. To save the fishery, the Israel Water Authority, which decides how much fish to stock and how to prevent overfishing, created new regulations. It set a minimum size for fish that can be sold on the market. The same overfishing happened in Lake Michigan, collapsing the lake’s fish stocks in the middle of the twentieth century, Dettmers said. “We all assume resources are infinite, at least initially,” he said. Cooperative fishery management between Canada and the Great Lakes states helped reduce overfishing and harmful invasive species. LANSING — Invasive plants can grow so thick and tall they hide the world’s greatest Lakes. “In the lower part of the state it’s pretty bad,” said Laura Bourgeau-Chavez, a research scientist with Michigan Technological University.